The pope needed help. Threatened by political enemies and fearing for his life, he turned to the most powerful man in Europe: King Charlemagne of the Franks. On Christmas Day of the year 800, in Old Saint Peter’s Basilica, Charlemagne was crowned first Holy Roman Emperor. This empire would endure for a thousand years. Charlemagne followed a road to Rome that was already a thousand years old. Along it lurked the shades of Etruscans, Romans, Ostrogoths, Lombards, kings and popes. The archbishop of Canterbury would pass in the year 990; countless thousands of pilgrims would follow. Journeying between Rome and Florence, Michelangelo and his fellow artists would draw inspiration from the marvelous ruins along the way. This was the Roman Via Cassia. Before the rise of Rome, this region was home to Etruscans and Faliscans, who hobnobbed with the Greeks: they became the first literate people in Italy, and the first with aristocracies and urban centers. Culturally precocious, they created artistic masterworks and developed technologies in construction and hydrology later emulated by the Romans. After resisting Roman expansion for centuries, they were finally overrun, and their brilliant cultures faded away. 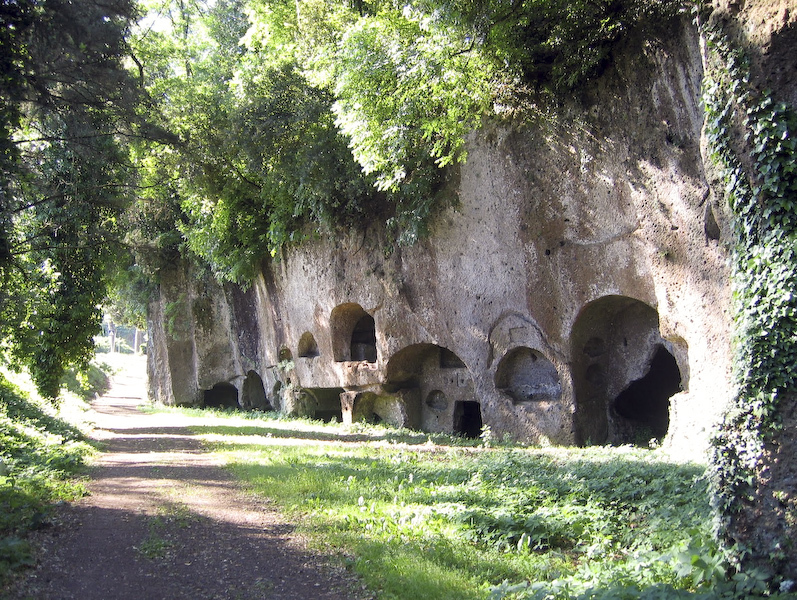 The town of Sutri was central to these events. 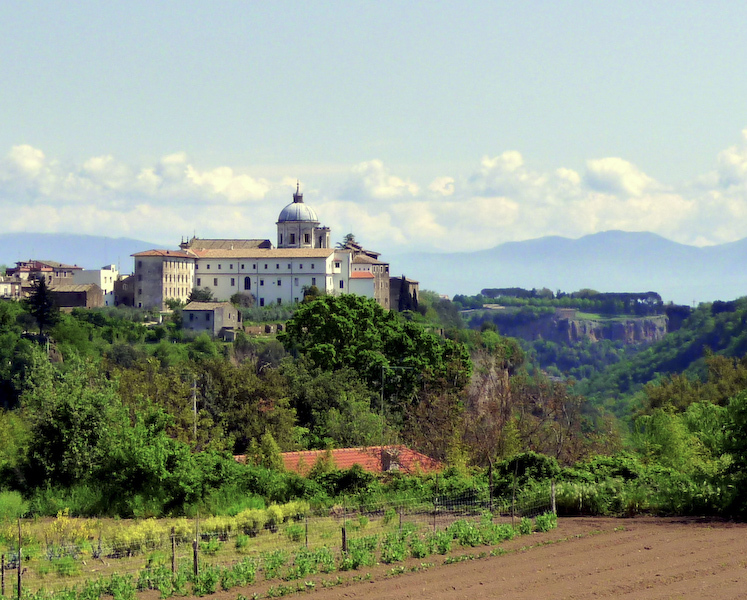 Originally Faliscan Sutrina, it was later fortified by the Etruscans against the Romans. 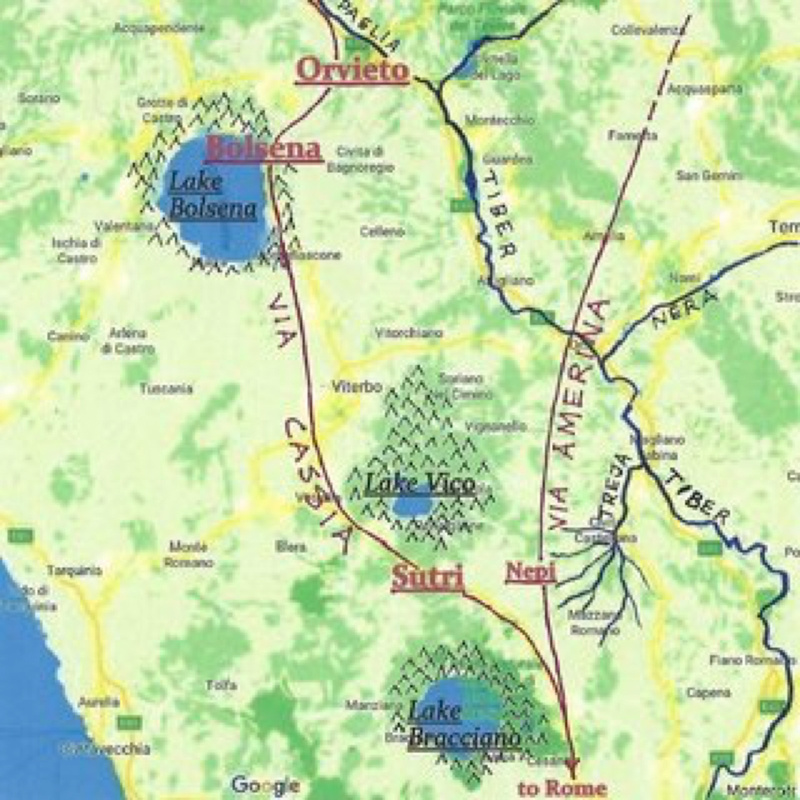 Guarding the narrow pass between two volcanic clusters (map: Lakes Bracciano and Vico), it safeguarded the Etruscan heartland to the north. 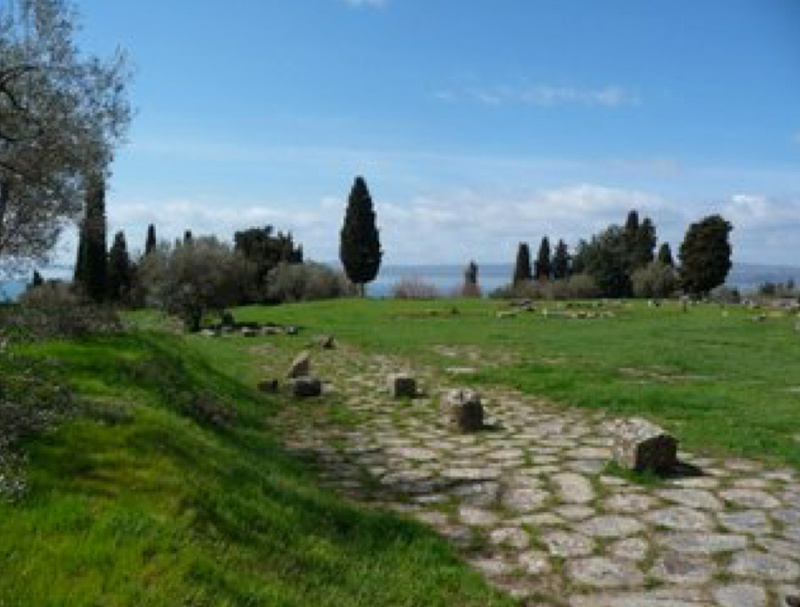 In the end it became Roman Sutrium on the new road to Florence: the Via Cassia. 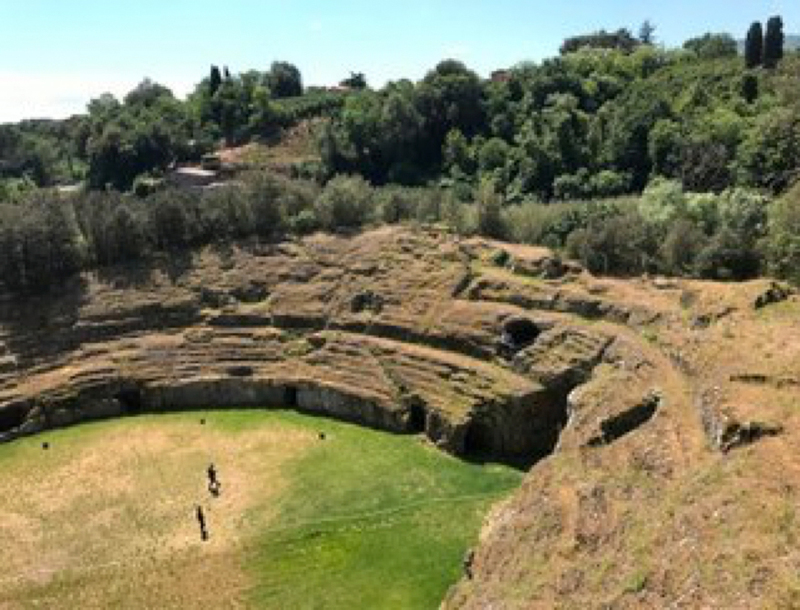 Today Sutri still has a Roman amphitheater carved in stone, dozens of Etruscan tombs, a subterranean cult chamber of the Persian god Mithras, and striking ancient road cuts. In the middle ages it became a bone of contention between the pope and the invading Lombards from the north. 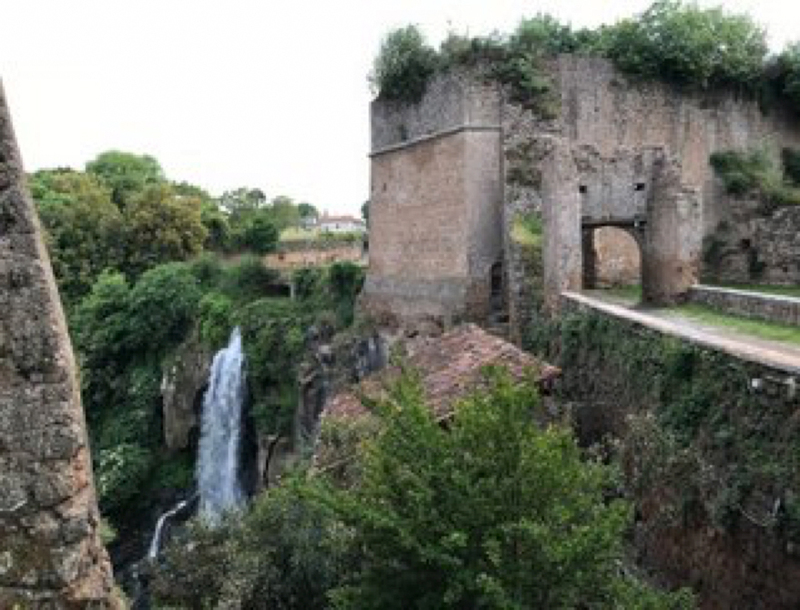 In the historic “Donation of Sutri,” it was presented to the pope by the Lombard king in 728, becoming the first territory of the Papal States, which gobbled up much of Italy in the succeeding centuries. 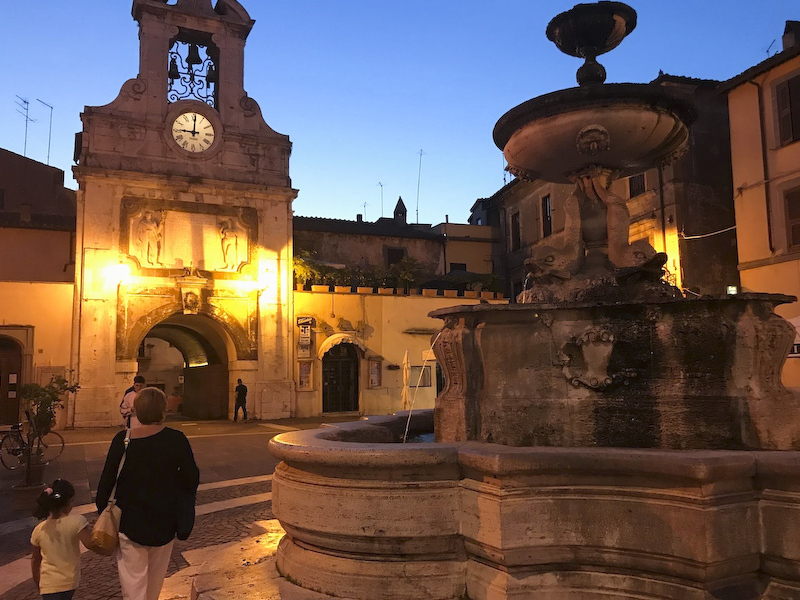 Legend holds that Charlemagne stopped in Sutri on his way to Rome in the year 800, and there met a young man named Orlando, the son of his banished sister Berta. Raised in Sutri, Orlando was to become his chief paladin, a fabled hero celebrated in medieval song cycles. Local place names still recall Charlemagne and Orlando. Nepi was another Faliscan town which became Roman. 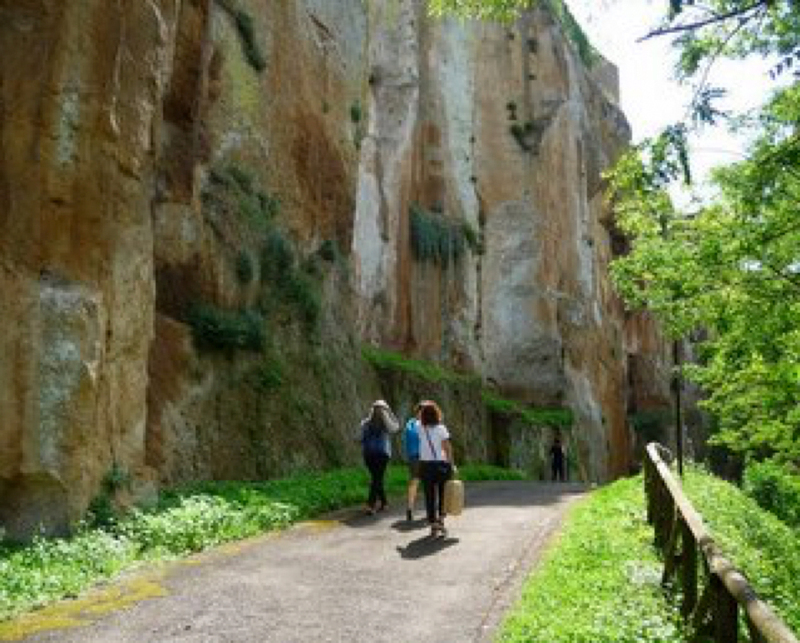 It is home to a massive 15th-century fortress, once the property of Lucretia Borgia. The Roman Via Amerina, with some original paving, passes through the fortress. 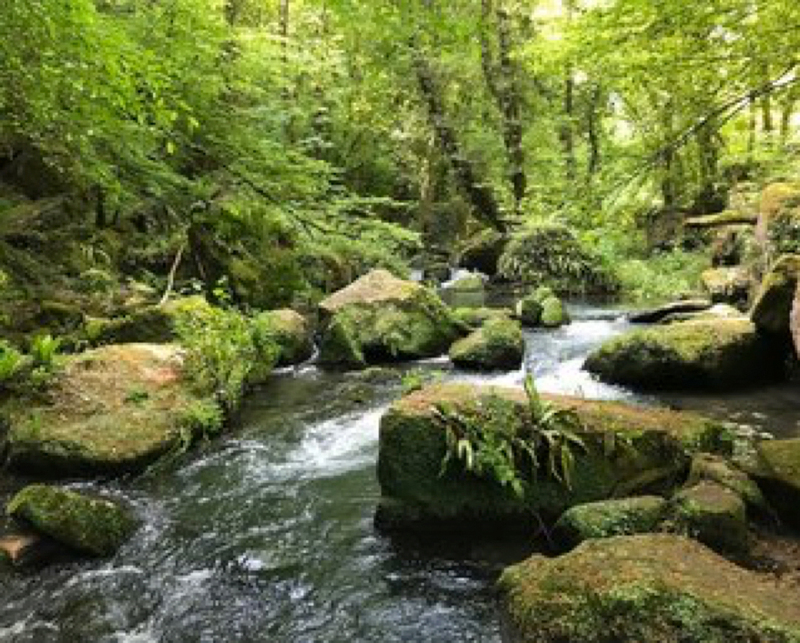 Alongside it is a waterfall and a deep gorge funneling into the nearby Treja River. Scenic paths abound in the Treja Valley Park. Heading north from Sutri, the Via Cassia arrives at Bolsena. Along the way are beautiful views of Lake Bolsena, Europe’s largest volcanic lake. Tracts of original paving remain. 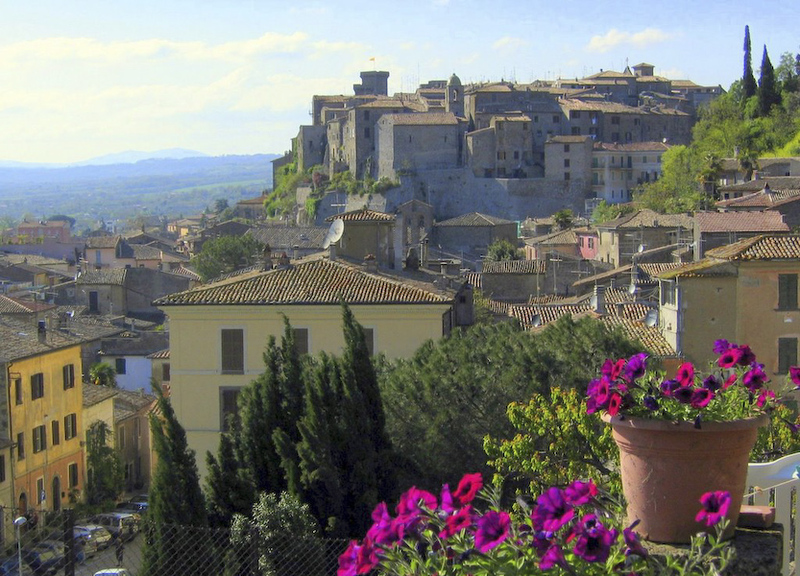 On a hilltop, Bolsena’s old medieval center clusters around the Monaldeschi Castle, now an archaeological museum. Nearby are remnants of the original Roman town: forum, cisterns, workshops, houses with mosaic floors and decorative wall paintings. 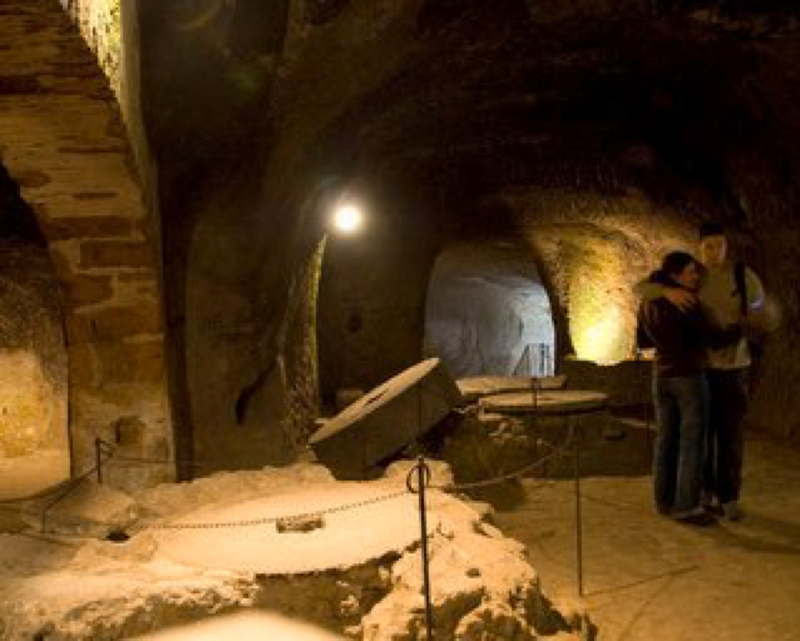 The ancient Church of Santa Cristina shelters catacombs and an altar where the 13th-century Miracle of Corpus Domini occurred. A tree-lined boulevard leads to the picturesque lakeshore, with small craft harbor, beaches and restaurants. 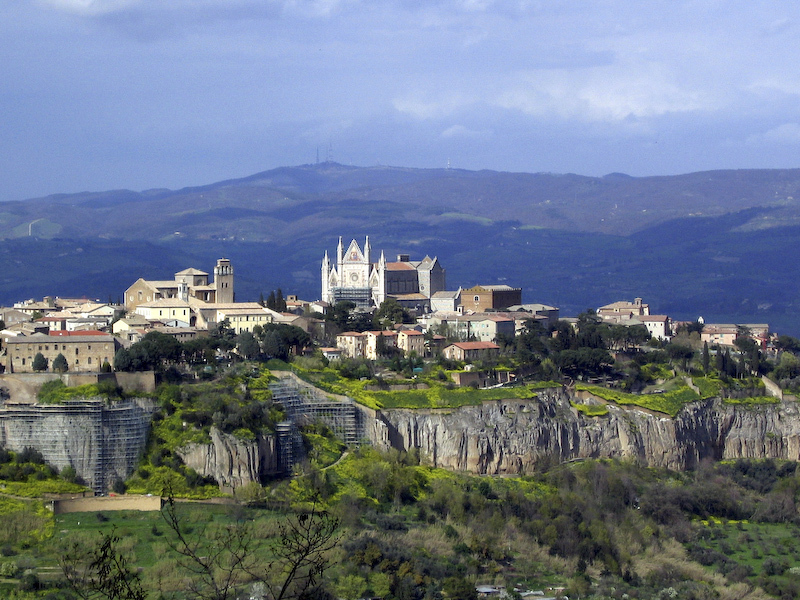 Orvieto is the Via Cassia’s next destination. 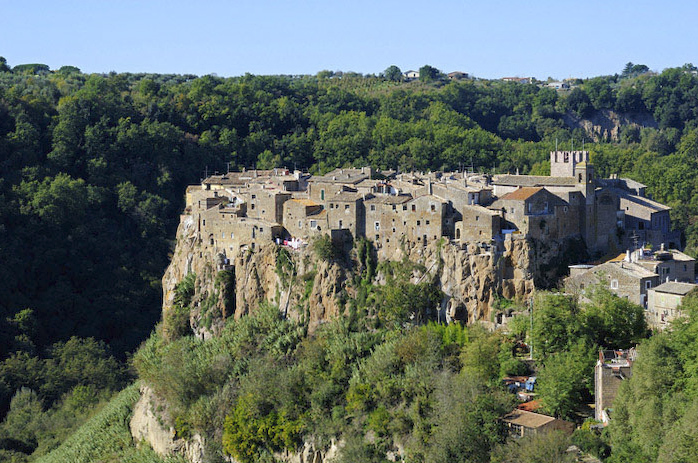 Once a powerful Etruscan city on a high volcanic butte, it was destroyed by the Romans in 264 BC. 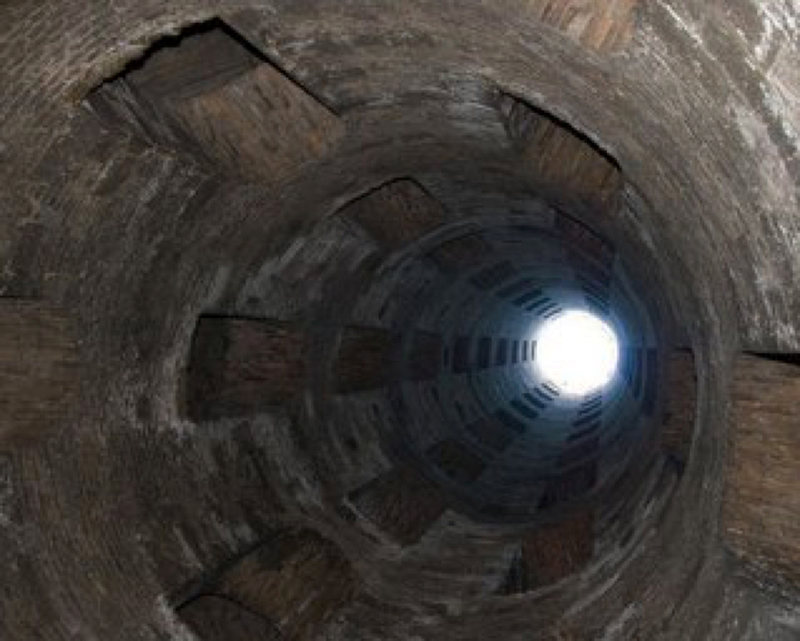 Below the town is a vast underground network: wells, aqueducts, workshops, storerooms, dovecotes and more. Several fascinating visits are available. Orvieto is famed for wine, hand-painted pottery and the most beautiful Gothic cathedral in Italy, built in the 14th century to commemorate the miracle mentioned above. The town is ringed by a trail around the butte with gorgeous views of the surrounding countryside. based on double occupancy — add 10% for single. 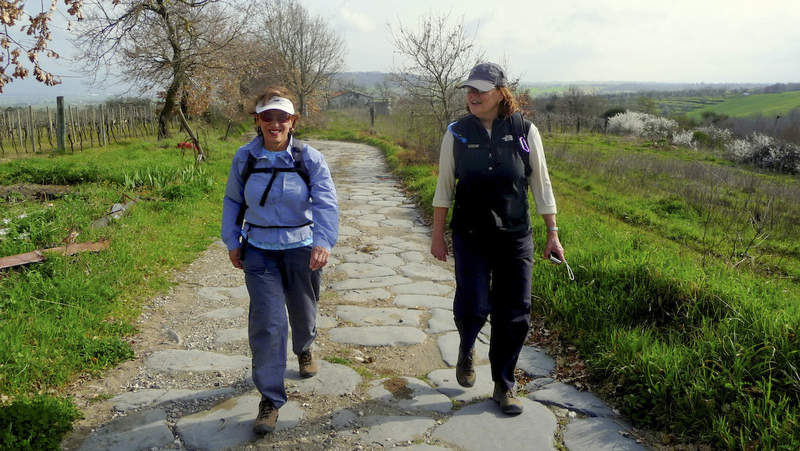 Includes daily guided walks (typically 5-8 miles per day), all meals, wine, lodging, transportation and admission to museums and archaeological sites. Flight to Rome not included. Price in US Dollars calculated at time of trip. 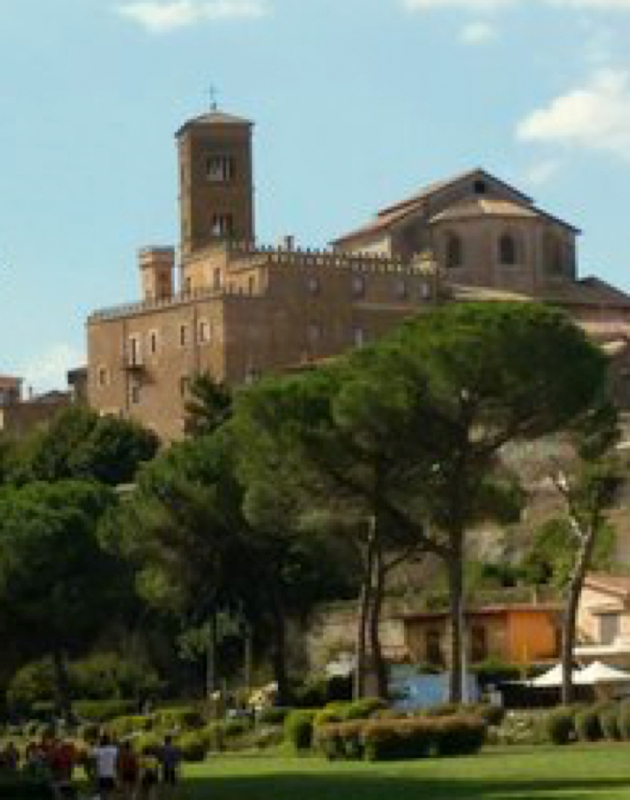 Our departure is from Rome’s Trastevere district between 10 and 11 am on the start date. Spending at least 2 nights in Rome before your trip is highly recommended if you are coming from North America. Lodging suggestions available. Write to me with questions or to book your trip. Booking deposit US$500 per person. All trips are custom designed for four to six guests, and there are many options. Learn more at www.romanroadwalks.com or write to me. To unsubscribe, click here and put “unsubscribe” in the Comments box.